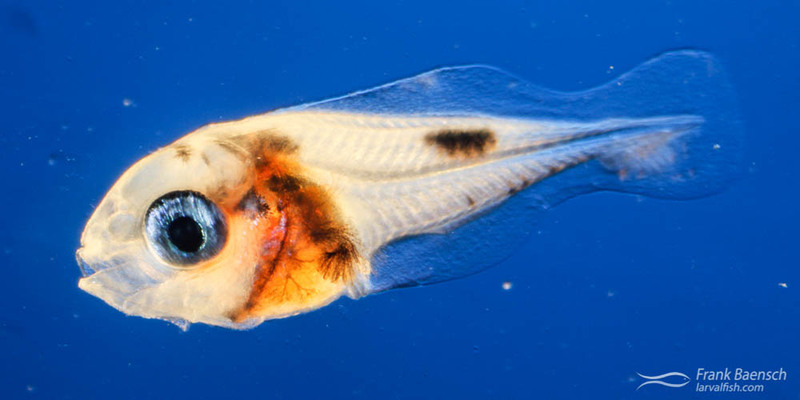 Hawaiian dascyllus larvae (Dascyllus albisella) were raised from wild-spawned eggs at 77-79F on wild copepods and artemia. The Dascyllus genus comprises ten, deep bodied and mostly pale colored (D. auripinnis is colorful) damselfish species limited in distribution to the Indo-Pacific. Members of this genus generally form schools of up to a few dozen individuals over coral heads and feed on zooplankton in the water column. All species are believed to be protogynous hermaphrodites. The eggs are laid on hard substrate and defended by the male until they hatch. Juvenile dascyllus are attractive and hardy but will often grow into aggressive adults that dominate community fish tanks so novice aquarists usually purchase them. Several members of this genus have been captive-bred but not for commercial purposes. Adult Hawaiian Dascyllus (D. albisella) on a reef in Hawaii. Hawaiian dascyllus (Dascyllus albisella) juveniles were reared on two occasions in July and August of 2013 from collected, wild eggs. D. albisella is endemic to the Hawaiian Islands and Johnston atoll. It spawns year round and increases reproduction when water temperatures rise during the spring and summer months. D. albisella eggs (0.5 x 0.7 mm) are oval; clear; and contain a large, single oil globule. D. albisella larvae hatch after 4 days (2.4 mm TL) at 78°F. They are capable of feeding on 60-70 micron nauplii less then 24 hours after hatching. Flexion occurs 10-13 dph (4.0-5.1 mm TL). During this period the body noticeably widens and develops reddish pigmentation around the mid-section. D. albisella larvae start to settle near 20 dph (5.5 mm TL) when the body pigmentation becomes darker and more disperse. They aggregate along the tank sides and can start to feed on artemia. By 25 dph the larval body is almost completely black with white patches under the pectoral fin and the dorsal fin. At this time the larvae can safely be transferred to juvenile grow-out. Full characteristic juvenile color and behavior is present by about 30 dph (7-9 mm TL). D. albisella juveniles have the tendency to gorge themselves on artemia without suffering from digestive disorders. This species is easy to raise on copepods and undergoes no obvious bottlenecks or critical periods of high mortality. Hawaiian Dascyllus (D. albisella) larvae raised in the laboratory. In the ocean, Hawaiian Dascyllus settle out among branches of the hard coral, Pocillipora meandrina, and the tentacles of sea anemone, Heteractis malu, when available. For a related study, University of Hawaii scientists “seeded” the juveniles cultured for this project on P. meandrina coral heads to test their survivorship and growth. Eight months later most of the restocked juveniles were still alive, which indicates that successful artificial settlement of this species is possible. Bret Danilowicz first raised D. albisella and D. aruanus for his fish PHD thesis research at University of Hawaii way back in September 1992.